Later Jesus said to them again, "I am going away. You will search for me but will die in your sin. You cannot come where I am going." The people asked, "Is he planning to commit suicide? What does he mean, 'You cannot come where I am going'?" Jesus continued, "You are from below; I am from above. You belong to this world; I do not. That is why I said that you will die in your sins; for unless you believe that I AM who I claim to be, you will die in your sins." 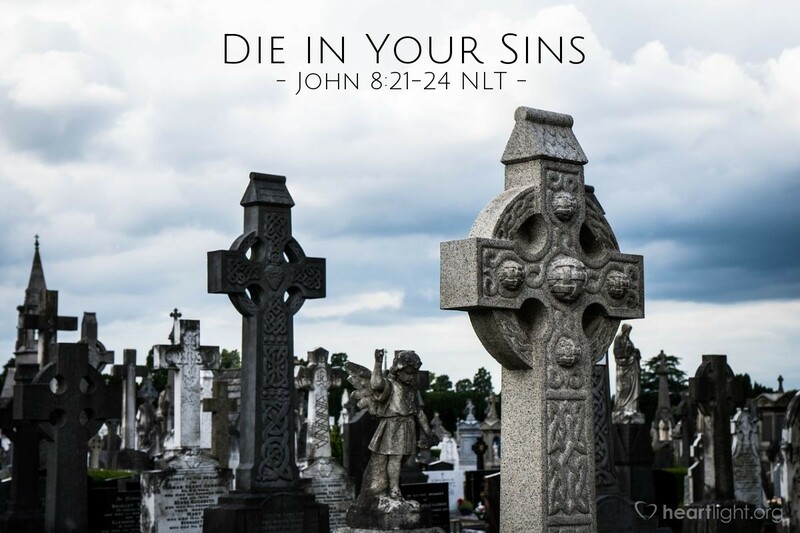 Jesus came to deliver us from sin and its consequences. God sent Jesus as our Savior and Lord. Jesus makes the importance of his coming clear: Those who die in their sins will not come to be with him in heaven. Unless people believe that he is God with us, they will die in their sins. (Actually, Jesus said "unless you believe that I AM," using the name of God from Exodus 3:13-14; "who I claim to be" was added by the translators for clarity.) Jesus came from God to bring us back to God. He is not from this world and is not bound by this world. He is from above and will return to take us back home with him. Father, thank you for my faith and for all those who helped me come to faith. I know that my trust in Jesus as your Son and my Savior has changed my eternal destiny. Thank you for giving me a way to escape my sin and its guilt and stand before you as your righteous child. I know that these gifts come from your love and grace. Thank you! In Jesus' name. Amen.